Every day, we lose ourselves in the patterns of daily life. Our habit energy pushes and pulls us to and fro and we're left with little opportunity for experiencing life in a way that we're fully present for this very moment. Some daily activities lend themselves more to this state of autopilot than others. There are some things in our life which we do so often that we become like drones, doing them in a mindless and habitual manner day in and day out. Those activities include walking, driving, certain types of work, as well as eating (among others). But these activities also lend themselves to mindfulness practice because while these patterns are attractive to the pull of habit energy, they're also the perfect thing to grab onto when we want to become fully present to our lives in any given moment. Mindfulness is both the quality and the practice of becoming (and staying) fully present to our lives in this very moment. It's mindfulness which allows us to break these habitual patterns and make a change for a more present and wakeful life. Eating perhaps lends itself to mindfulness practice more than any other activity. This is because we find the flavors we experience when we eat often both interesting and varied and the act of eating enjoyable. And so it's through the simple practice of mindful eating that we can become more awake to our lives and discover greater peace and joy in the process. We can also, at times, develop bad habits in connection with food and the act of eating. These bad habits, some even considered disorders, can cause us a lot of suffering. 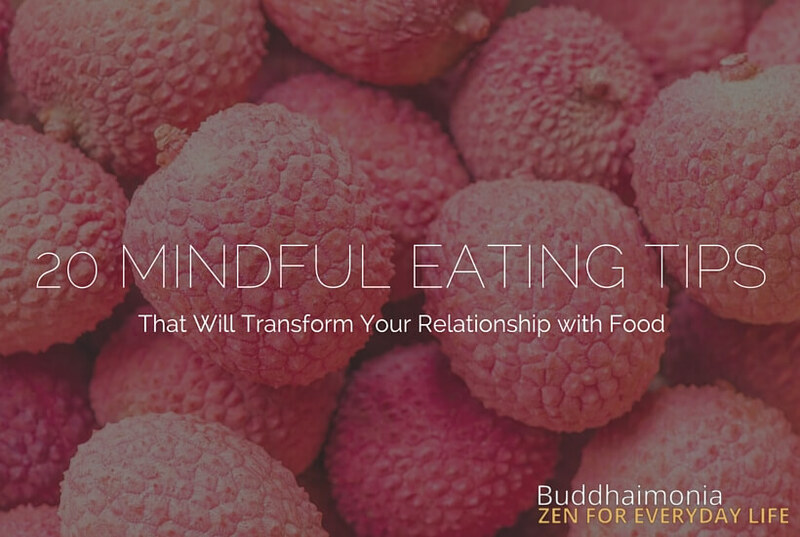 The practice of mindful eating can shine a light on our habitual patterns connected with eating and food itself. And in doing so, we can relieve much of the suffering we experience connected with the food on our plate. Pause- Take a moment before eating to notice the aroma, visual appeal, and even texture of the food. Savor the various sensations which accompany your meal. This short moment will help your awareness open up so that you become more fully present to the act of eating. Eat mindfully- Be mindful of the lifting of your hand/fork/spoon and the act of chewing the food itself. Pay close attention to each flavor in your mouth and notice how the food feels and smells as you eat it. As your primary point of (light) concentration during mindful eating, be fully present for the act of chewing. Acknowledge thoughts, feelings, and sensations- When thoughts, feelings, or other sensations arise within your field of awareness, simply be mindful of them, acknowledging their presence, and then allow them to pass as if they were floating by on a cloud. Eat mindfully (again)- Then, bring your focus back to the act of chewing. You'll lose your mindfulness constantly in the beginning. Don't worry, this is normal for any form of mindfulness practice. Simply repeat the process from steps 2-4 and attempt to eat mindfully for as much of your meal as possible. While eating with mindfulness remain open to any thought, feeling, or sensation that comes into your field of awareness and don’t attempt to push them away. Accept whatever arises openly and then bring your focus back. Many of us grew up in families (or knew someone who did) who prayed or gave thanks before meals, so this is one you're likely familiar with. But whether or not you've ever done it yourself, you can take a cue from that and do your own little practice of gratitude at mealtime. Just take a moment to appreciate the meal in front of you. Cultivate gratitude for it by thinking of the huge amount of work it must have taken to get all of the various ingredients together for you to enjoy this wonderful meal (really, when you think about it, it's pretty astonishing). This practice isn't just good for your well-being, it helps you center your attention on the meal in front of you, so it's the perfect practice to start each meal off with. For some, this may sound obvious and a given. For others, this will be difficult! Because mindfulness practice is about becoming fully present to our lives in the "now", in this case through the daily activity of eating, it's a bad idea to attempt to eat mindfully while being on the move walking (running?) or driving somewhere. Correction: it's not going to happen (at least successfully). Part of mindfulness practice is about doing one thing at a time, so do yourself a favor and respect meal time. Sit down, relax, and become present to the meal in front of you. There is a misconception that you have to do something slowly to do it with mindfulness. That's not quite true, but it may be necessary at the beginning when you're just getting the hang of mindfulness practice. The reason for this is that to do something slowly helps us focus mentally on the activity at hand. The more quickly we move the more difficult it is for our mind to keep up with our body, so slowing down is an increased opportunity for mindfulness. At this point, this one should seem like a natural progression from the first few points. We're trying to put our complete and undivided attention on the moment that we're eating- both on the act of eating and on whatever arises within that moment of eating- so any electronic devices within eyesight can serve as distractions from our mindfulness practice. Turn off your T.V., close your phone, turn away or at least sit away from your desktop computer, and away from anything else that could potentially distract you while you're eating. This is all about being fully present to each bite that you eat. The way we usually eat, we take a bite and then immediately begin preparing another bite to eat as we're chewing the original bite. This is a subtle version of multi-tasking, a habit you're trying to undo with mindfulness practice. What you'll notice very quickly, if you've just begun your mindfulness practice (or even if you've been practicing), is that we don't know how to properly focus on one activity. Some of the ways we multi-task are so subtle they're difficult to detect. Mindfulness practice begins to change that, albeit slowly. The next time you eat, make it a point to be fully present for the bite in your mouth. Leave your utensil on the table and experience that bite fully with mindfulness. They do this to help improve their practice of mindful eating, therein emphasizing the act of chewing, the focal point in mindful eating. The way most of us eat, we chew just a few times and swallow what are still larger pieces. Not only do we throw down our meal quickly and not leave much time to be present or much less rest ourselves in peace and quiet, we're not very kind to our digestive systems. By chewing each bite at least 30 times, we not only help promote mindfulness practice, but we're kinder to our body and our mind as a result. When you first practice this it can be difficult to fight the impulse to swallow your food, but with practice, it will become easier. It's definitely worth making the effort. Aside from chewing each bite 30 times, Zen monastics also eat each meal in silence. The reason for this is that silence itself, as blank and empty as it might seem when we think about it in our heads, in reality, is very nourishing. Explaining why is difficult, but any form of activity, even a simple conversation, brings additional activity to the mind. And this activity, when constant and unrelenting as it so often is for us in our everyday lives, perpetuates a greater sense of chaos and confusion (however subtle). This is OK for a time, but eventually, and regularly, we need a break. Silence allows us to go home to ourselves more easily, which is really what mindfulness allows us to do more than anything else. For this reason, it's the perfect complement to mindfulness practice. From time to time, you can stop eating and take a moment to become mindful of your breath. You can either simply be mindful of the quality of your breathing right now or take 3 purposefully deep and mindful breaths. If you're new to mindfulness practice, I'd suggest simply paying attention to the breath as it is. This simple but powerful mindfulness practice will help recenter your focus as several minutes of doing the same thing can often lead to mindlessness and falling asleep (literally). This might feel a little awkward, but by switching hands, you'll compel yourself to eat with greater mindfulness because of the extra work your brain needs to do to keep up. This is a really simple mindful eating tip that can help you in the beginning of your mindful eating practice. This is one of my favorite mindful eating tips on this list and one that can completely put you into the right state of mind in an instant, so it's really helpful. Act like you're a food critic (whether your meal is fine dining or leftovers) and eat slowly and carefully while paying attention to every little flavor that arises while eating. Pay attention to every little sensation you feel as a result of each individual bite. Of course, stop short of the damming restaurant review. That won't be very helpful to you in your practice. There's really nothing more to it than that. That simple state of mind can often be all you need to bring more mindfulness and attentiveness to meal time. While eating, certain sensations will arise such as the feeling of hunger, satisfaction, fullness, and sometimes overfullness! Be particularly on the look out for these cues. By doing this, you make it easier to notice the other things which arise while being mindful and that will further sharpen your mindfulness and concentration. Fork pointing up - Scooping motion, no need for accuracy. Laziness possible. Fork pointing down - Stabbing motion, accuracy, and attention necessary. Laziness not possible, for the most part. That says it all: eating with your fork pointing down, with a stabbing motion to pick up your food, is the way to go (most of the time, at least) as it helps keep you more attentive and present while eating. And that helps your practice of mindful eating. This is another simple mindful eating tip which helps for much the same reason that switching hands and pointing your fork down helps. By now you may have noticed that while you can do anything mindfully, mindfulness is improved greatly when we create the right environment for us to concentrate on our point of focus (in the case of mindful eating, that being the act of chewing, tasting, etc.). The idea is simple: use a different utensil that makes it a bit more difficult to eat. This can be a variety of things, but the easiest and most accessible options would be chopsticks and a smaller spoon/fork. Personally, chopsticks are very accessible and really help to improve my ability to stay present while eating. And they can be used to eat most things, so I'd suggest trying this out. Of course, if you grew up using chopsticks this might not be the case for you. So, keep that in mind. This is obviously not something you can always take advantage of, but when possible eat a meal or snack that takes work to eat such as seeded grapes, pistachios, or an orange. That little bit of work to avoid the seed, break the shell, or peel and separate the orange can not only mix up the act of eating and create more variety but help keep you attentive naturally. Plus, we're talking about eating more whole foods, which is always a good thing. As I mentioned earlier, some activities are better suited for mindfulness practice than others. Drinking is one of those activities. Particularly something very hot or cold. You could make a regular practice of drinking a cup of tea or coffee each day mindfully before your breakfast or another meal. This is a highly nourishing practice in itself that also serves to make you more mindful before your meal, so it's a win-win. You can read how to practice a simple mindfulness tea (or substitute) meditation here. May we with all beings realize the emptiness of the three wheels- giver, receiver, and gift. Certain Zen practitioners chant the above simple phrase before every meal. The idea is to remind themselves that their meal was a gift and to see the true nature of life itself in the meal. Specifically, the oneness of giver, receiver, and gift. By repeating this simple phrase, you can perpetuate a subtle shift in the way that you see the world. The shift from giver, receiver, and gift being separate to them being one constantly connected, interrelated, and even same entity. Like looking deeply into the food that you eat (#18), this point doesn't just enhance mealtime and make it a more nourishing activity, but it helps us bring more mindfulness to the activity at hand by focusing the mind. As I mention in this and the next point, the practice of mindful eating can extend beyond just the eating of the food. Cooking the Buddha is about cooking and preparing your food mindfully so as to deepen your relationship with the food and emphasize mindfulness. When you cook or prepare food, as you gather your ingredients, lay them out, cut them up, and put them wherever they need to go (a pot, pan, stove), be mindful of exactly what you’re doing in that very moment. You’re not cooking food to be eaten, you’re simply cooking the food, and you’re doing it with all of your being. We can take mindful eating one step further by contemplating on the nature of the food in front of us. Like taking a magnifying glass to something, contemplating on the true nature of our food is the practice of looking deeply into each individual piece of food on our plate and seeing not only where it comes from but also what it’s made up of. Looking, or seeing, deeply is a simple exercise made popular by Zen master Thich Nhat Hanh which involves essentially picking an object, particularly a natural object such as a whole fruit, vegetable, or plant, and working backwards to the "origin" of the object and seeing all the countless factors or "ingredients" that allowed that piece of fruit to exist as it is in this moment. This exercise can really deepen your experience with the food in front of you and turn each meal into a chance to nourish your well-being. Another simple thing you can do is to simply change up what you eat, or where you eat, from time to time. This is simple, but, changing up anything, from what you have for breakfast from cereal to fresh fruit to eating next to your bedroom window as opposed to your kitchen table, can help compel you to greater mindfulness. This won't last forever, but often all you need is a little switch up to further promote your mindfulness practice and help make it more of a daily habit. 20. Designate a "mindful snack"
One thing I often talk about for those new to mindfulness practice is designating a single major everyday activity and focusing on that for a week or two (at least). Make it the one and only activity you place any focus on for that time. The idea there is to develop mindfulness as a daily practice, and it works great in this case as well. About 2 years ago I did this with watermelon juice. My wife makes incredible watermelon juice, so my sons and I would often request it- especially during the summer- to the point where we drank it every week. I decided that would be my "mindful food/snack" and so I simply focused on being mindful of that with regards to everything I ate and drank and nothing else (aside from my tea in the mornings). That might sound like a weird thing to do this with, but I enjoyed it so much and the color and fragrance were so strong that when I drank it I'd naturally be compelled to some greater state of mindfulness, so I decided to use that to my advantage. Preferably, do this with a snack you really enjoy and whose flavor and/or fragrance or visual appeal is strong so that it helps compel you to greater mindfulness. Do this for a week or two and you'll find yourself practicing mindful eating more often throughout each day. This is a powerful strategy and definitely one of my favorite mindful eating tips on this list. No matter how you choose to bring the practice of mindful eating into your life, know that it's both highly nourishing and a simple and easy mindfulness practice to start with. And if you've practiced mindfulness for some time but just haven't given it a try yet? It's a powerful practice for bringing more mindfulness into your life. I hope these 20 mindful eating tips help you not only live with more mindfulness but bring greater peace and happiness into your life as a result.